The Oakland Raiders will likely have a new starting running back in 2019 with Marshawn Lynch and Doug Martin both not expected to return to the team. They have already signed one new running back, inking former New York Jet Isaiah Crowell to a one-year contract. It appears they are not done yet though as they have been linked to some of the top running backs in the draft, and they also reportedly worked out Robert Turbin on Thursday in Oakland. West spent the last five seasons with the Chiefs after signing as an undrafted free agent out of Abilene Christian. In 52 career games, West has carried the ball 268 times for 998 yards and seven touchdowns. He also has 77 career receptions for 589 yards and six touchdowns. His best season was in 2015 when he had 160 carries for 634 yards and four touchdowns in addition to 20 receptions for 214 yards and one touchdown. 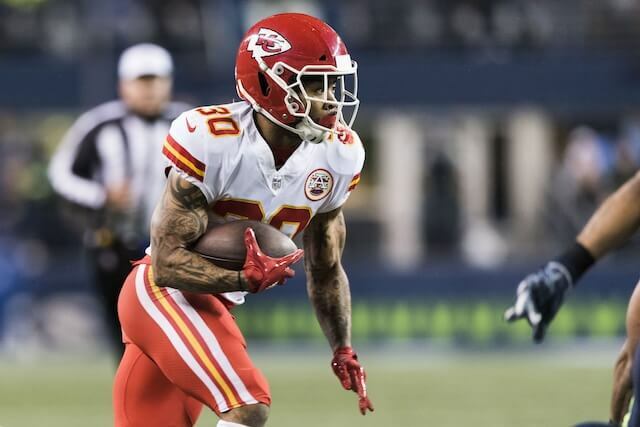 He did not get much work in 2018, appearing in just three games for Kansas City. West is more known to be a change-of-pace back, although the Raiders already have Jalen Richard to fill that role barring him being traded or released.